When new neighbours move in next door, Eddie is disappointed that there is a new friend for his sister but not for him. But then Tom needs help putting up shelves in the kitchen and asks Eddie to help him as his little girl and Eddie's sister explore the garden together. Soon Eddie is learning to use a saw and hammer and is screwing in hooks to hang cups. Eddie's sister hates bathtime, so Eddie uses some leftover wood to make her a boat to play with in the bath. Next day, as the two families share a picnic lunch in the garden, a cat attacks a sparrow trying to eat the crumbs from the table. So Eddie and Tom decide to build a bird table for the sparrows to eat in safety. Soon Eddie is making and mending all sorts of things around the house. This delightful story about two families becoming friends as seen through Eddie's eyes also includes practical instructions to make some of the things Eddie learns to make. 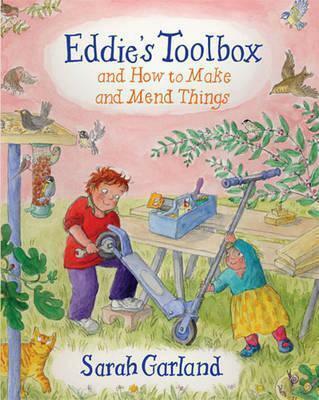 A delightful companion to Eddie's Kitchen and Eddie's Garden, this book will appeal to all children fascinated by tools and making things, and to fans of 'Bob the Builder'. SARAH GARLAND is a much-loved author/illustrator who has published more than 40 books. The daughter of a publisher and illustrator, she trained as a typographer at the London College of Printing. She has written many books for children, and also books for adults on herbs and their uses. She lives in Chedworth, Gloucestershire. Her books for Frances Lincoln are Eddie's Garden and Eddie's Kitchen; Going to Playschool (9781845077204), Doing the Garden (9781845077211), Going Swimming (9781845077228), Coming to Tea (9781845077235), Going Shopping (9781845077259), Doing Christmas (9781845077242), Having a Picnic (9781845077266) and Doing the Washing (9781845077273); Billy and Belle (9781845070380); Dashing Dog (9780711219119); Polly's Puffin (97818447800275), Pass It, Polly (9781847800282) and Zoom (9781845073466).